I find myself leaving the house and grabbing a “to-go” knitting project to take with me, often socks. Nothing like knitting away while waiting in line at the post office, or in a waiting room, or trapped at an awful social event. Usually I have just a little mesh project bag with my sock and yarn in it… No notions. 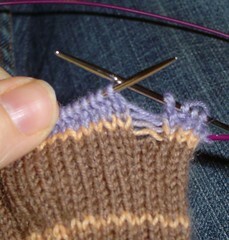 I will be happily knitting away, then, a moments distraction, and a stitch jumps off the needle. Of course the best way to remedy this situation is to use a crochet hook to pick up the stitches. But I don’t have one in my bare bones travelling sock project bag. So I decided to make one that I could keep with me, even on the go. Behold! 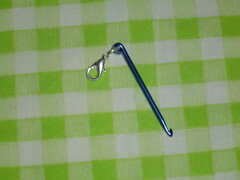 The keychain crochet hook. 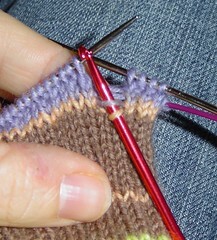 To start, clip the hook near the flat part in the middle. You want to keep the flat part connected to the hook, and move as far down the handle as you can. If you get all the way to the round part, it may be too difficult to cut through. 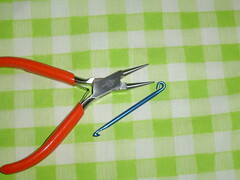 Then, use the needle-nosed pliers to fold the flat part of the handle back into a loop. 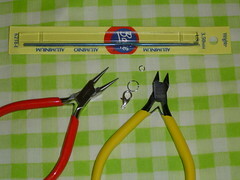 Use the same pliers to attach a jump ring and a clasp. 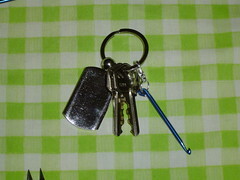 Now you can clip it on your keychain and remove it whenever you have a dropped stitch that needs saving. * I know that it is practically unbelievable, but I got this hook for 25 cents at a thrift store. 53 Responses to "Keychain Crochet Hook – A tutorial"
She was talking about a dropped stitch in knitting. If you drop a stitch in crochet yu just pick it up with your hook. Knitting is a little more complicated. 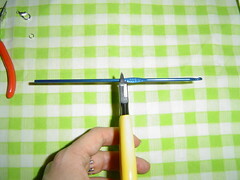 Where from chainkey mini crochet hooks pls let me know pls and how much too ???? I had one of these but had to take it off my keyring. It got caught on every sweater or loose knit garment I had.